SNAFU! : Russian Arctic brigades get armored bulldozers....via Army Recognition. 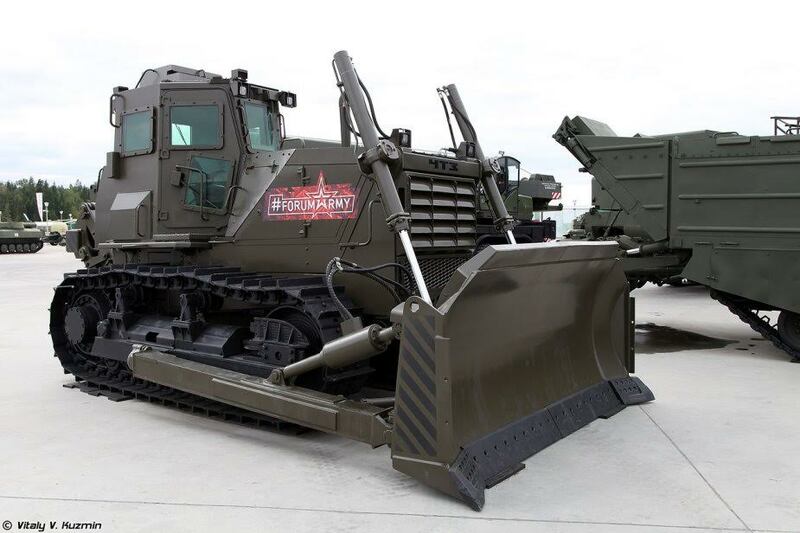 Russian Arctic brigades get armored bulldozers....via Army Recognition. Arctic brigades received bulldozers which are fully armored and can sustain grenade explosions, small arms fire and even antitank missiles. The bulldozers will be engaged in roadworks, hardware evacuation under fire and fortifications destruction. The vehicle is fit for operations in the North. Its engine starts up at temperatures of minus 60 degrees Centigrade, the Izvestia daily writes. The Russian Defense Ministry told the newspaper the armored bulldozers had already been supplied to Arctic brigades. The Syrian experience showed the armed forces need cheap and simple hardware. The bulldozer got an armored capsule for the driver and the hood. It weighs 20 tons and develops a speed of 10 km/h. It has been upgraded for the Arctic and can operate at temperatures ranging from plus 45 to minus 60 degrees. 20mm-thick armored plates protect the driver from bullets, fragmentation and even antitank missiles. The cabin and side doors have armored-glass windows. Bar screens can be mounted on the bulldozer to protect it against cumulative shells and handheld antitank grenade launchers. The Syrian experience showed the combined armor decreases human losses and increases the effectiveness of missions. Bulldozers are necessary to rapidly erect fortifications, clear blocks and build simple engineering obstacles, e.g. earth banks and bankets. They also move big volumes of soil, refill trenches and craters, clear blocks and barricades, repair roads during combat actions. In peacetime, the bulldozers can assist people in emergencies. The armor will not affect the characteristics of the vehicle. It will save the driver from falling trees and debris of buildings. "The vehicles are widely used in the Middle East. Naturally, there are no barricades in the Arctic, but bulldozers are necessary to clear ice and snow and make roads," expert Sergey Suvorov said. Many world armies operate armored bulldozers. The United States has been using them since the war in Vietnam where they erased jungle. During the Iraqi Freedom operation in 2003 the US army and marine corps acquired 12 armored bulldozers in Israel for engineering work. Israel is upgrading US bulldozers for its armed forces. They have armor and glass that sustain fire from any small arms and grenade launchers. Besides, the bulldozer can carry additional smokescreen equipment, machine gun or grenade launcher which are operated from the cabin. The crew of the Israeli armored bulldozer comprises two men: the driver and the shooter, the Izvestia daily said. Is it just me or does it seem like Russia is really focused on getting necessary gear to their Arctic Brigades? I don't recall if they still use the "Guards" system to identify their high profile/high readiness units but the Arctic Brigade seems to be the newest love of their Ministry Of Defense. The West has various small unit cold weather specialist. Royal Marine Mountain Leader readily come to mind. I'm sure the Netherlands, Switzerland and the Canadians have similar type units, but does anyone outside of Russia have/or is building complete Mechanized Brigades for Arctic work?